***A section of notes that has terms to know, objectives, the product and quotient rules, step by step instructions for simplifying nonfractional square roots. 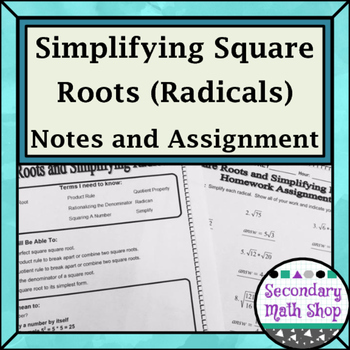 ***The notes go on to give step by step instructions for simplifying square roots that contain fractions and require rationalizing the denominator. ***I have included worked out examples for student reference as well as example problems for a teacher to work out with his/her students or to assign for students to work individually or in small groups. ***I have included a blank set of the notes for students to follow along and fill in during the lesson. ****Additionally there is chart that includes the numbers 1 - 100 with both their squared value and their simplified square root (when applicable). 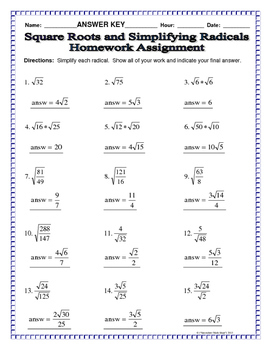 ***I have also included an assignment of 15 problems that can be handed out as homework or utilized as a quiz. ***This is a perfect resource for Algebra or for Geometry as introduction to a unit on Right Triangles. 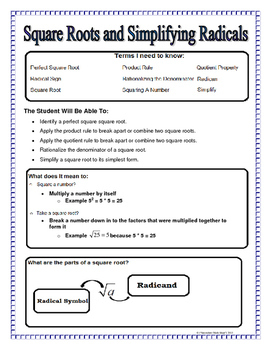 Geometry Simplifying Square Roots Riddle Worksheet. Geometry Right Triangles Trig Bellwork Exit Cards Station Questions. Geometry Right Triangles Trigonometry Square Roots BINGO Game. 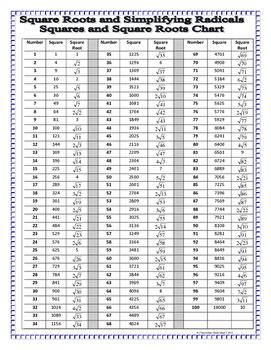 Geometry Right Triangles Trigonometry Square Roots Vocabulary Matching Activity. 30 60 90 Special Right Triangles Notes and Practice. 45 45 90 Special Right Triangles Notes and Practice. Soh Cah Toa (Sin Cos Tan) Introduction To Trigonometry Notes and Practice. The Pythagorean Theorem Notes and Practice. The Law of Sines Notes and Practice. Angles of Elevation and Depression Notes and Practices One and Two. Square Roots and Simplifying Radicals. The Converse of The Pythagorean Theorem Investigation Activity. Right Triangle Unit Vocabulary Cards and Posters. Right Triangle Unit Vocabulary CCSS and I-Cans Wall Hangings. Right Triangle Unit Vocabulary Assignment and Puzzles. Sin Cos and Tan Soh Cah Toa Trigonometry Riddle Practice Worksheet. Geometry Pythagorean Theorem Riddle Worksheet. Geometry Special Right Triangles Practice Riddle Worksheet. Geometry Angles of Elevation and Depression Riddle Practice Worksheet. Right Triangles and Trigonometry Graphic Organizers. Geometry Right Triangles Trigonometry Square Roots Note Cards. While each product can be purchased individually at the above links -- You can save 20% by buying the entire unit bundled together!!! Geometry Right Triangles Complete Unit Bundle.